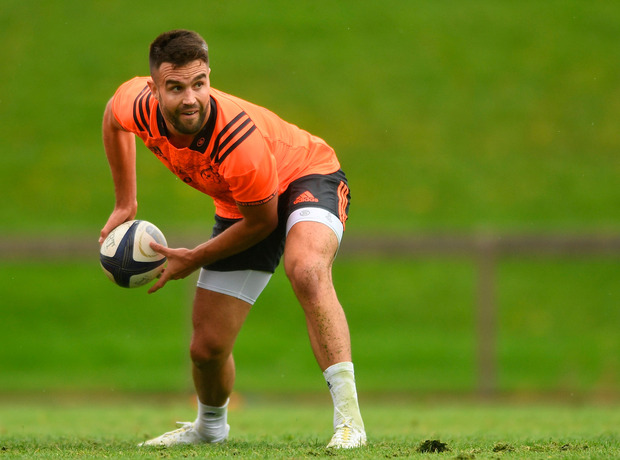 Conor Murray knows there are doubts about Munster's capacity to build on last season given the impending exit of Rassie Erasmus and he's not shying away from the issue. He has barely settled into his chair at the Sports cafe in the University of Limerick when he brings the issue up himself. On the pitch, he prefers to meet a challenge head on and off it he is taking a similar approach. Everyone in the Munster dressing-room knows that the uncertainty around the future direction of Munster's coaching ticket is undermining faith in their ability to build on last season's progress, but he is determined to prevent any slide. Just when they appeared to be back on track after a campaign that saw them return to the last four of Europe and reach the Guinness PRO14 final, Erasmus and his assistant Jacques Nienaber announced they were heading home. Murray was enjoying a prolonged post-Lions break when the news came through and he's not about to pretend that he was happy to hear it. "Initially, I was like, 'f***!'. I was really frustrated in a selfish way because they're such good coaches and people," he recalls. "You want to keep them, because they're driving something really good here. "They're taking it by the scruff of the neck and they've driven it on to a place we wouldn't be without them. We might be on the way there, but they've accelerated it. "But you can't be annoyed at them, it's their country calling and their dream job. You wouldn't begrudge them at all." So, the South Africans will exit the province mid-way through this season and while Johann van Graan is widely expected to take over, we await an official announcement. Part of the senior players group, Murray is being kept in the loop about progress on that front but he is also intent not to let the impending change halt Munster's march back to the top of the European game. Erasmus has, he says, kept things business as usual while adding to the province's game-plan. The plan is for a seemless hand-over when the new man takes over. "The level of uncertainty for us is about who the new guy is going to be, is he going to be like Rassie and Jacques, is he going to change things?" Murray says. "Initially when I was ringing the lads when I was on holidays, they told me nothing had changed. They explained the situation and why it's happening and they're saying, 'we're not going anywhere until the new year or whatever and we're going to keep driving it on'. "There's a good maturity level in the squad. It's a young squad, but lads realise that such a good thing has happened in the last year. "We have them for another while, surely when they leave we can continue that. "It's not going to be the exact same when they leave, but we've picked up things. "The goals remain the same, silverware is massive for this club and we did so much ground-work last year. "To be at that level again, we need to work really hard and grow some more. "There's no point in hiding it, this transition period when the lads leave is going to be really challenging and that's up to us. "We're really hungry not to take a step back when that happens, because we've worked so hard to get the buzz back around here. "And it is back, we've got to keep it going. That's the main driving force from my point of view and the other players. "We don't want to take a step back because we're so competitive now, we're so close to clicking that we'll work extra hard with whoever comes in, with Jerry (Flannery) and Felix (Jones) to keep it as it is and keep growing again." Today, Murray and his team-mates return to the Aviva Stadium - a venue where they lost three of their biggest games of last season. Perhaps more pertinently, however, it is the first of a series of anniversaries they will have to negotiate in the coming weeks. This fixture was the last Anthony Foley was part of before he died in Paris. Munster are used to emotion and having gone through all the grief last season, Murray believes they can handle the inevitable attention. "There will be tributes and things like that," he says. "When it happened last year it went on for ages. Every week, the opposition team wore a T-shirt with No 8 on it, there were tributes and everything. We almost had to get used to it, every week was something. "Then it calmed down for the rest of the year, but we referenced Axel... not a hell of a lot, because that's just being brutally honest - we can't keep using Axel as an excuse for getting up for games, use emotion. "He's with us, what happened last year was terrible. To get through it the way we did was really impressive, he'd have been proud of us. "You're used to distractions as players, when the year anniversary comes up you're going to have to deal with it. "It'll never be as hard as the Glasgow game, if we can do that we can do anything. "I'm not worried about being distracted or anything, it'll be nice because people will be remembering him and talking about him the way he should be talked about." The simple analysis was that Munster's revival was fuelled by the emotion of Foley's passing, but Murray believes that falls well short of telling the full story. "People used that as a way of highlighting it, that we were playing on emotion and playing for him, which was true, but no one asked about before that, about the things that Rassie, Jacques, Axel, Felix and Fla were doing, the buzz that they were creating in the training centre," he says. "We had the same players as before, but something good was happening. Then, obviously what happened just accelerated things, we got to that level a bit quicker. But I assure you if Axel was still here we'd still be on that curve." Enjoying what they're doing appears to be a particular focus for this Munster team who are determined to move out of the shadow of the team that won the 2006 and 2008 European Cups. Initially, he concedes, their legacy weighed heavily on a group of players who watched those players as fans but struggled as team-mates. "It definitely was a burden, because when you were playing with the older lads - when Pauly (O'Connell), ROG (Ronan O'Gara) and Donners (Donncha O'Callaghan) were still here and you were starting in the team and we weren't winning," he said. "I know we got to a couple of European semi-finals and essentially it's another game away and then you're at that the same level - so you're not that far away. "Then again, they had 10 years of not winning things and then two European titles in three years, that's their history. "That's what we want, but nobody's burdened by it (now). You want to emulate it, but it's not who we are. "We enjoy our rugby now, if you're constantly chasing something and burdened by something then your career will be over and it's 'f***, I didn't really enjoy that - I was always trying to chase something. "We're enjoying what we're doing here, hopefully success comes with that." Defining success is another challenge altogether and Murray concedes that he has mixed emotions about his last big adventure with the Lions in New Zealand. Certainly, he enjoyed the experience but admits the drawn series was a difficult pill to digest. "I don't know, the draw was weird. It was a flat feeling and we didn't know what was going on," he says. "But again a couple of days later when you step out of that bubble it is a good result. New Zealand are the best team in the world and we pushed them close. "Obviously the selfish, competitive side of me and every other player was saying 'could we have won? We probably could have, that's really annoying'. "But that's sport, I thought we gave it a really good effort. "Was it fair? I don't know. We thought we had the ability to win, they thought they had the ability to win and it is what it is. "It makes it a little flat. "The series win was great four years ago, winning the series in New Zealand would definitely have been bigger than that and to not do it is annoying. But we didn't lose, so that's something you can be proud of I suppose." After the tour, he needed a long break from the game but today he's back at the Aviva Stadium, hungry for more. "Mentally, I'm fresh. The body is fresh," he enthuses. "People always say it's a big year this year, but every year is big. We've a short window, the career only lasts so long so it's about making the most of it, try and get silverware and as much out of it as you can."